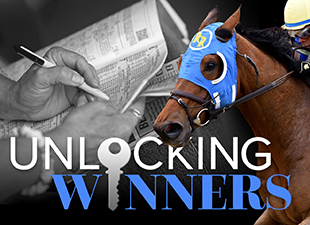 The Grade 1 Haskell Invitational has been a major summer stop for 3yos for quite a while, but this year's running will achieve new levels of importance with the arrival of American Pharoah. The first Triple Crown winner in 37 years has bedded down at Monmouth Park, where he will kick off the final chapter of his racing career, which will likely contain no more than four more races. Seven other 3yos have entered against him, though only five of them seem certain to run, with Todd Pletcher entering three but committing just Competitive Edge as of now. Whatever the final line up, assuming American Pharoah shows up with something resembling his Triple Crown form, which resulted in a trio of comprehensive wins and TFUS Speed Figures of 129 (Derby), 127 (Preakness) and 130 (Belmont), this group has its work cut out for it. But he still has to do it on the track Sunday, and we shouldn't simply consider it a given that he will. 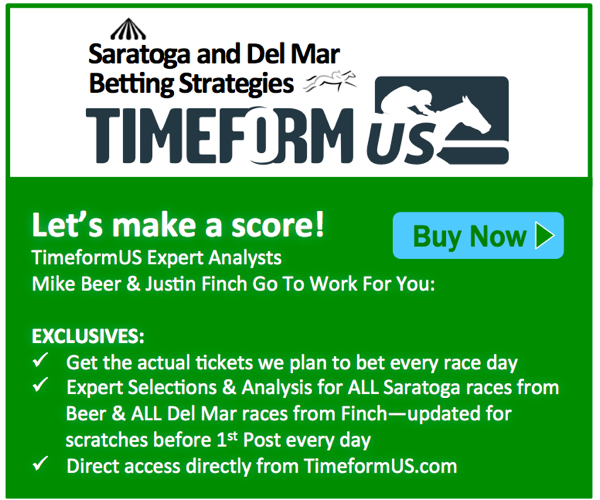 The TimeformUS Pace Projector for the Haskell anticipates a fast pace, and expects American Pharoah to be a part of it. He will be up there with Competitive Edge early, though Nonna's Boy, the other horse projected to be showing speed, is not yet confirmed for the race. Competitive Edge is fast, and he has run some big races in his career, but he is stepping into the deep end rather quickly for his first start around two turns and first beyond a mile, and he is doing so on the back of his worst career effort, when last in the Woody Stephens approximately six hours prior to American Pharoah's Belmont Stakes triumph. We do think he will be going to the early lead on Sunday, but we will be surprised if he is still around at the end. The two entrants with the most to offer as alternatives to American Pharoah are Upstart and Keen Ice. Upstart never got himself untracked in the Kentucky Derby, but he was a legitimate player on the way to that race. After running a gallant 3rd in the Breeders' Cup Juvenile to conclude his 2yo campaign, Upstart picked up right where he left off at 3. He won the Holy Bull with a new top TFUS Speed Figure of 116, then finished first (DQ to 2nd for interference) in the Fountain of Youth with a 115. He engaged in a race-long battle with Materiality in the Florida Derby, before settling for second best with a figure of 120. He is starting back in a tough spot following his Derby disaster, but make no mistake; this is a very good racehorse, and his presence ensures that American Pharoah cannot just parade around the race track on Sunday. Keen Ice is coming on nicely for an upset-minded trainer, having run the two best races of his life in the two toughest spots, the Derby and the Belmont. He was a trip horse in Kentucky after catching plenty of traffic while trying to rally from the back of the pack, and he was finishing up as well as anyone that day after bulling his way out into the clear late in the game. He earned a new career top figure of 119 there, and topped that with a 124 at Belmont. Again, as well as he ran in those two races, he was never within hailing distance of American Pharoah, and he would seemingly need that horse to show up with something far below his best, or get hooked up in the kind of fast duel that will leave him vulnerable late, in order to have a realistic chance at the upset. American Pharoah is a very likely winner of the Haskell, and is not a heavy favorite we are interested in wagering against. 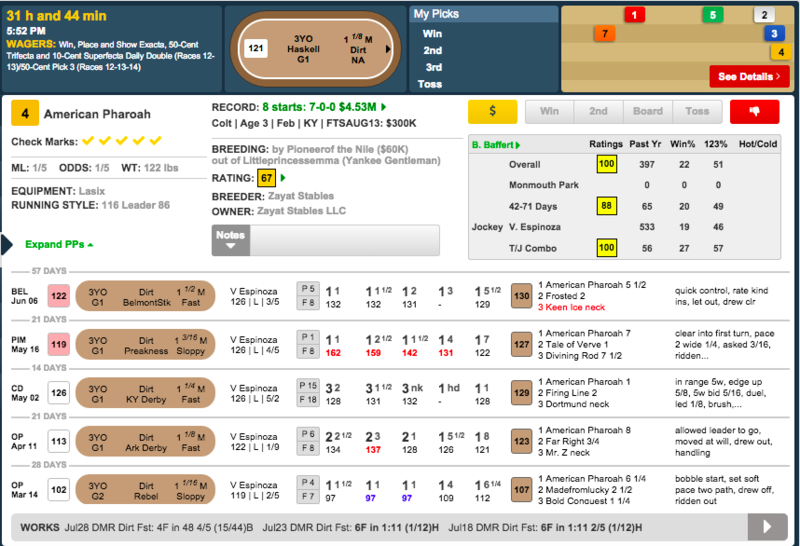 Upstart is the horse most likely to upset him, but it is a tall order for the second choice on the ML.